You know that scene in Crocodile Dundee where a guy flashes a knife, and then the Aussie dude says, "That's not a knife! This is a knife!" and then he whips out a crazy-big knife? Well, there are beer festivals, and then there is the Great American Beer Festival. And if you love beer, you need to go to Denver for three days in October at some point in your life. Here's why. 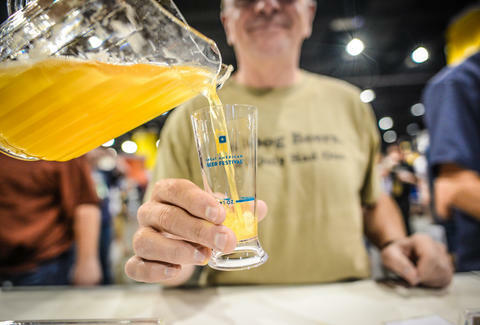 Every year, the Great American Beer Festival takes over the Colorado Convention Center. And when I say "takes over," I mean there are breweries pouring beer as far as the eye can see. If you're farsighted, that probably doesn't seem too far. But I have 20/20 vision, and it is extremely far. Behind long, long tables are volunteers and brewery employees pouring every single beer style you can imagine (96 of them, not including subcategories) from craft breweries all across the country. Once you've bought a ticket, all the beer inside is free -- they slosh a 1oz sample into your officially sanctioned plastic cup. And while some rare beers do run out early on, you still have your choice of more than 3,800 beers from 800+ breweries. Try to wrap your head around that. When I go to a beer bar, I'm psyched if it has more than 15 taps. Because even some of the better craft breweries in America are unable to ship their stuff to every state, GABF is the best chance you'll have to try beer from breweries that don't make it out your way. For example, Wisconsin's New Glarus, Michigan's Short's, and other beloved breweries typically have people lining up for samples all three days of the fest, and it's for good reason. The beer is delicious, and unless you live in WI or MI, you likely don't see their beers. But if you don't live in WI or MI, you probably also aren't snowed inside your house 11 months out of the year, so it's not all bad news for you. Dogfish Head always has one of the longer lines to get samples at GABF, and while that's absolutely because DH pours some of its rarer, incredible beers, it's also because its founder Sam Calagione is working the booth by filling up people's glasses. It should be said that Sam does not have to do this. He's there because he absolutely loves talking about beer with fans, and they love him right back. Same goes for Adam Avery of Avery Brewing, Garrett Oliver of Brooklyn Brewery, and Boston Beer's Jim Koch, all craft beer OGs who often show up and join an army of other living legends of craft. I'd recommend heading over to the "Meet the Brewer" hall, where people who work at your favorite breweries will be happy to nerdily obsess over their beer with you. There's an incredible feeling of camaraderie around Denver during the festival. Sure, it helps that everyone has an elevated blood alcohol level for three days straight, but brewers are a delightful lot of people, and they really seem to like one another. You'll see them greet one another like people at a family reunion. And it's not just the brewers -- everyone attending is a huge beer fan, and some have traveled a long way to be there. I'm not a hippie (full disclosure: I have attended more than five Phish shows), but there's something about being in a place where everyone there wants to be there. It's a place you want to hang out in. If you're not in a good mood when you get there, you'll surely be in one when you leave. GABF is open for 4.5 hours each day for three straight days. The city of Denver, however, is drinking craft beer the entire week, and for nearly 24 hours a day. Even breweries that aren't going to be at the fest are throwing parties all over the city -- this year, 3 Floyds is pouring four of its beers at a Denver brewery. Tap takeovers are the rule, not the exception. Beer-pairing dinners abound. Here is but a small sampling of what you can do in the Mile High city that week: play in a ping-pong tourney with brewers, catch a punk/metal show for charity, and hit up a Sierra Nevada tap takeover. The city has even branded the week of GABF Denver Beer Fest. Hell, even if you get shut out of the fest because tickets sell out so quickly, it's worth it to fly to Denver and see if you can drink the town dry. I'll admit that the dining options in the Colorado Convention Center are fairly basic. People wear pretzel necklaces and snack on those in between sampling beers. But if you've got the cash (and you're fast enough), buy a ticket to Paired. Please note: you have to also get a ticket to GABF -- this is like an extra-special event inside the very special event. It's super low-key, and held in the back of the convention hall where some of Colorado and the nation's best chefs pair rare beers from select breweries with their food. This year there's some ridiculously good-sounding pairings, like Lost Abbey beer with Philly chef Marc Vetri's cuisine, NOLA Brewing with seafood expert Francisco Millan's eats from Boston's Row 34, and Chicago's Haymarket beer paired with dishes from one of Denver's best chefs in Frank Bonanno. Or, you know, you can buy a hot dog in the main hall, too. Either way, the beer's going to be fantastic. And while, sure, GABF is about the beer, it's about a lot more than that. It's about a few days of nonstop (responsible) drinking with people who love craft beer as much as you do. It's about making new friends from across the country, some of whom make the beer you have in your fridge. It's about… you know what? You're just going to have to come visit and see what it's all about. Lee Breslouer is a senior writer for Thrillist, and can't wait to go to GABF. Follow him to sample beers @LeeBreslouer.